Tim Johnson, curator of special collections and rare books at the University of Minnesota Libraries holds an original copy of A Study in Scarlet, written by Sir Arthur Conan Doyle. It was the first story to feature the character of Sherlock Holmes. Sherlock Holmes may be the most famous private investigator of them all. Holmes is also one bookstore owner’s first choice when a new English reader asks him to recommend a mystery novel. Otto Penzler owns the Mysterious Bookshop in New York City. He also works as an editor, preparing mysteries for publication. Penzler has spent his career reading, writing, editing and selling mystery novels. In such books, a character might have been murdered. Or someone stole a valuable possession. A private detective or investigator tries to solve the case. Penzler serves as the editor of a book that comes out each year. It is called The Best American Mystery Stories. The book is a collection of short stories. Penzler is an expert on mystery writing. When asked, he has often urged visitors to his bookstore to read Arthur Conan Doyle’s series about Sherlock Holmes. Penzler says English learners also might enjoy reading about Agatha Christie’s detective, Hercule Poirot. 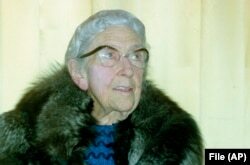 A photo of British mystery writer Agatha Christie, taken in 1974. She created the detective Hercule Poirot. While both Christie and Conan Doyle lived a long time ago, Penzler says “they’re the most self-evident recommendations we can make in the store, and we do.” For one reason, their writing is clear and simple. Some English teachers are using mysteries as a way to get students involved. Penzler thinks that is a great idea. If you want to learn about American life, you probably need to read stories from many different authors. Penzler says there is no one mystery author who paints a picture of the United States. But as a whole, writers provide detailed images of what it is like to live in a particular city or state. Most mystery writers spend their time writing about one character and one city. For example, Michael Connelly writes about a Los Angeles police detective named Harry Bosch. Bosch loves jazz music. He often eats pancakes at a diner at the Los Angeles Farmer’s Market when he is investigating a case. Many of Connelly’s stories deal with police and politics in Los Angeles. John Sandford writes about detectives in the northern state of Minnesota. Sandford once worked as a writer at a Minneapolis newspaper. So his stories present clear details of what life is like in Minnesota. Robert B. Parker was famous for writing about a private investigator who went by only one name: Spenser. Spenser lived in Boston and so did Parker. Parker wrote about the people and places around Boston: from costly cocktails in fancy hotels to doughnut shops in working-class neighborhoods. 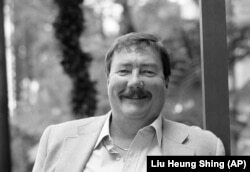 Author Robert B. Parker was known for creating the Boston private investigator named Spenser. 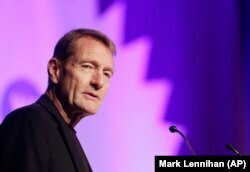 Penzler likes to suggest Lee Child for readers who are more experienced with English. Child writes about a retired Army policeman named Jack Reacher. Reacher travels by bus and train and often gets into difficult situations. But he always comes out safe in the end. Otto Penzler says Lee Child is a good mystery author for advanced English learners to investigate. The best thing about mystery novels, Penzler says, is that many of the books are part of a continuing series. There are more than 20 books about Harry Bosch, for example. Will you look for a mystery book in English now? We want to know. Write to us in the Comments Section or on our Facebook page. Should Murder Mysteries Be Used in Classrooms?